Our range of products include non contact tachometer, digital manometer testo-510, lux meter, hygrometer and clamp meter. 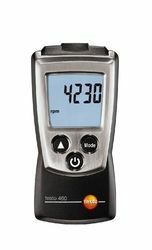 Product DescriptionThe lightweight, pocket-sized testo 460 RPM meter provides you with quick and reliable readings when carrying out checks on fans, crankshafts and motors. And because the checks can be performed while the machines are still running, there’s no need to stop production or shut down machinery. 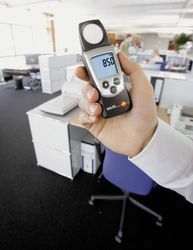 Product DescriptionWith the testo 510 differential pressure measuring instrument, heating installers and air conditioning engineers will be well-equipped to carry out their work: the instrument measures differential pressure from 0 to 100 hPa and can help you check filters on air conditioning systems or measure static gas and gas flow pressure on heating systems, for example. 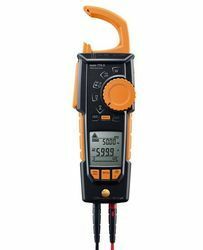 Product DescriptionThe testo 540 lux meter can be used to measure both artificial and natural light and provides you with a quick and easy means of measuring lighting conditions in the workplace. 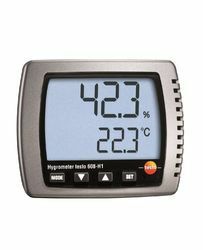 Product DescriptionThe testo 608-H1 digital thermohygrometer is ideal for continuous measurement of the indoor climate. You can therefore use the temperature and humidity measuring instrument in locations such as offices, warehouses, laboratories, garden centres or living areas to determine temperature, humidity and dew point. The hanging and standing brackets enable you to either hang the thermohygrometer on the wall or to place on a table or a shelf. We recommend you use the testo 608-H1 digital thermohygrometer if you only want to view the real time temperature and humidity measurement values and are not interested in measurement data documentation and management. The digital thermohygrometer with a large and clear display provides you legibility even from a distance and shows the temperature, humidity and dew point. In addition, you can display max. and min. values. Product DescriptionThe testo 770-3 clamp meter is the ideal clamp amperemeter for demanding measuring tasks in tight application environments. The movable pincer arm can be fully retracted into the instrument. This enables the instrument to grab tightly packed cables in a particularly accurate way. In addition, more specialized applications can be handled using the clamp meter, such as starting current, power and µA measurements. The supplied temperature adapter for thermocouple probes can be used to measure electrical parameters as well as temperatures (compatible type K thermocouple probe can be ordered separately). The clamp amperemeter automatically detects and selects AC/DC and other parameters, such as resistance, continuity, diode and capacitance,. This makes operation easier and more reliable than ever before. Your readings are clearly and distinctly presented on the two-line display. In addition to this, the testo 770-3 offers a performance measurement function and can be connected via Bluetooth to the testo Smart Probes App. In the App, the measurement curve can be displayed as a graph on your smartphone/tablet and directly documented in the report.